Interviewing for an audiologist job? Below is information on the types of interview questions you might be asked, advice on how to answer said questions, and a list of specific interview topics you're likely to encounter. Audiologist interviews may include a number of question types. Some of these questions will be behavioral. Behavioral interview questions ask you to explain how you dealt with past experiences on the job. You might also be asked situational interview questions. Similar to a behavioral interview question, situational questions will ask you questions about how you would handle a situation related to your job as an audiologist. You will also be asked questions that assess your hard skills. These are the skills and abilities that are critical to being an audiologist. 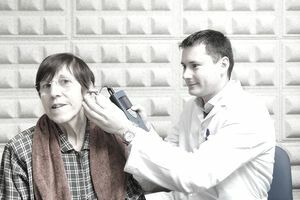 This might include various types of medical knowledge, as well as computer skills needed to administer hearing tests. Finally, you might be asked questions about the particular organization (school, hospital, etc.) where you are interviewing. Also, make sure you are up-to-date on the latest industry trends in audiology — for example, you should be aware of the newest technologies used by audiologists. This will help you answer any questions about your industry. Before the interview, do some research on the company you are interviewing with. Make sure you have a sense of their mission, the population they work with, and the company culture. Here are some sample audiologist interview questions. Describe the most difficult patient you've had to test and outfit with a hearing device. How did you handle the situation? Tell me about a time when one of your patients wanted to return his hearing aids. How did you handle the situation? How might this situation have been avoided? How do you maintain a positive relationship with your office and support staff? How would you handle an irate parent/teacher/principal? How would you manage a combative adult patient? Walk me through your process of giving initial exams to patients. With what assistive devices are you most familiar with? What hearing aid brands do you recommend for children? What is a comfortable caseload size for you? What are some references you recommend to your patients to learn more about hearing aids, cochlear implants, or other hearing assistance technology? What is your philosophy about the various communication approaches used by children who are deaf or hard of hearing? What tools do you use to ensure the hearing instruments are appropriately working for your patient? Why do you think working at our hospital will be a good fit for you? Why do you prefer working in a school environment over a hospital or clinic?